The two greatest European dictators of the 20th century shared what could be most aptly be termed an uneasy coexistence. While Hitler genuinely admired his Italian fascist counterpart, and found echoes of the Nazi Party’s ascension in the Blackshirts uncompromising rise to power, Mussolini did not initially warm to Hitler, deriding him as a ‘muddleheaded fool.’ Mussolini was likewise appalled when Austrian Nazis murdered his close friend Engelbert Dollfuss, the Austrian Chancellor, describing the event as an ‘abominable and repulsive spectacle.’ Upon a later trip to Germany in 1937, however, he was overwhelmed by displays of German military might as well as the Fuhrer’s indomitable will and multifaceted personality. Henceforth he largely, if at times reluctantly, ceded to Hitler’s desires – a decision that would result in his death at the hands of Royalists some eight years later. The first meeting between the pair took place in Venice in 1933, and is captured at some length in the present documentary with a selection of first rate footage. The trip was Hitler’s first official voyage outside of Germany, and upon disembarking his plane in civilian garb he was highly embarrassed to be greeted by Mussolini resplendent in full military regalia. His discomfort is evident in several subsequent scenes, such as when he stiffly salutes the Roman guard lining the airstrip. It wasn’t the first embarrassment for Hitler on the trip; when Mussolini delivered a speech to 70,000 fanatical loyalists Hitler wasn’t even allowed to appear on the same balcony; he had to watch from a separate vantage point so as not to steal any of the Duce’s limelight. The balance of power was soon to shift, however, and the Italian leader quickly revealed himself to be a pompous, bumbling, rather bulbous opportunist whose inept warmongering was a constant inconvenience to the Fuhrer. 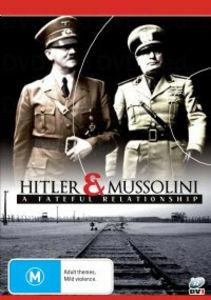 Hitler and Mussolini expertly explores the intricacies of this singular relationship, culminating in Mussolini’s fall from power towards the end of World War II and his daring rescue from a mountaintop fortress by a band of heroic Nazis, ordered by Hitler to abscond with the Duce at any cost. The analysis over the course of this two-part documentary is astute and the narration superb. The measured, thoughtful and comprehensive script is further supported by a wealth of excellent historical footage, some of it extremely rare. There are a couple of minor deficiencies. The two-channel audio is serviceable at best, and much of the present-day sequences are awkwardly shot and sit uncomfortably alongside the black and white archive footage. Shots of Hitler’s fascinating, intimidating ‘Wolf’s Lair’ bunker complex, for example, are filmed in such ridiculous close-up we may as well be looking at the walls of an underground car park. But overall this is a top notch documentary that will have plenty to offer anyone with a serious interest in the Fascist states, as well as the more general viewer, and is one of the best and most diligently researched studies of the relationship between these two fascinating, endlessly contradictory leaders.